Adopt-A-Pet.com News < PeoplePets.com promoting pet adoption! 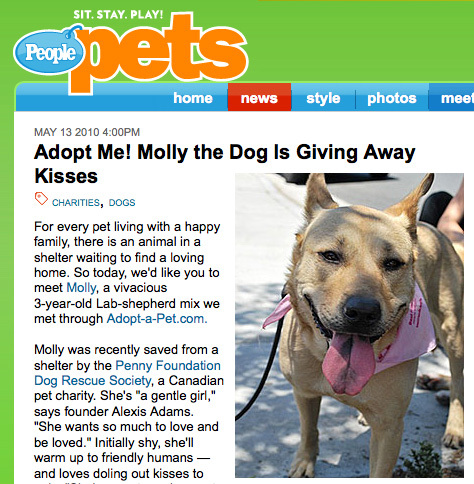 Earlier this week Adopt-a-Pet.com featured a rescue dog on Peoplepets.com — Molly, the Shepherd-Lab mix. Molly marked the kick off our “Adopt Me” partnership, where Adopt-a-Pet.com will be showcasing a new wonderful animal for adoption each month. Thanks for starting us off right, Molly! You can learn more about sweet Molly, as well as see celebrity pets, create your pet’s profile and share photos with pet lovers like you, all on Peoplepets.com. Adopt-a-Pet.com is thrilled for the opportunity to promote pet adoption and encourage more people to consider a shelter or rescue pet when they’re looking for their next furry family member. We’ve got thousands of great animals to choose from… we hope many of our pets will become Peoplepets soon. 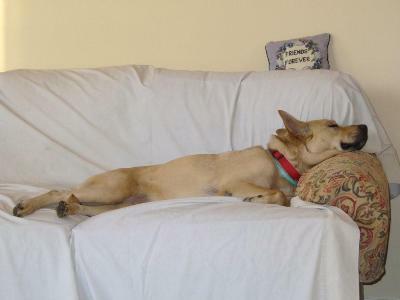 Molly sure is enjoying being a glamorous and famous pooch!